This DIY is for people who’s climate control lights have burnt out. Before pulling the HVAC, use a multimeter and test the middle HVAC harness to see if it is giving power to the lights (the red with blue strip is the positive and the red with yellow strip is the negative). If it is getting power but your HVAC isn’t lighting up, then your bulbs are blown. 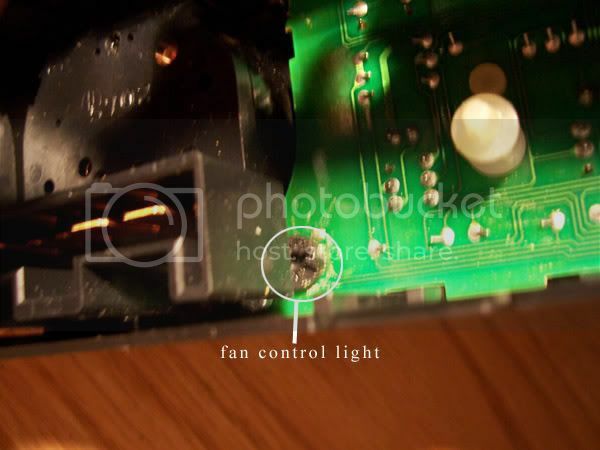 Another way of checking to see if it is only the bulbs that are burnt out is to check around for any other lights that work. For example, on my s14 the light that lights up the “driver window” button had a light in it that could be controlled by the dimmer switch. If all your lights are not lighting up, the dimmer switch has no effect or your not getting power to your HVAC light wires, than your problem lies elsewhere. Some say the dimmer switch shorts out or the TCU is burned out. You now have access to the brown circuit board within the case. On that board you will see three white clips. Use your pliers to remove them. After removing them, pull the brown board out to reveal the green board. The green board actually houses the lights you will be replacing. Two of them are very obvious and the third is hidden by the fan knob. Use a flathead to carefully pry out the knob on the front of the HVAC unit. To pull the fan control unit out, you’ll have to pull up clips on the top and the bottom while prying it out on the side. This is the top side. Remove the bulb by straightening the leads and pulling them out. Installation is reverse of removal. after you have the bulbs replaced, put the HVAC case together and reinstall it.